Mersey Weir is a minor waterways place minor waterways place place on the waterways major waterways place village town city on the Manchester Ship Canal (Main Line) between Walton Junction (Junction of Manchester Ship Canal Main Line and Walton Lock Branch) (9 miles and ¼ furlongs and 1 lock to the west) and Pomona Dock No 4 (Junction with Branch to Bridgewater Canal) (7 miles and 3 furlongs and 3 locks to the east). 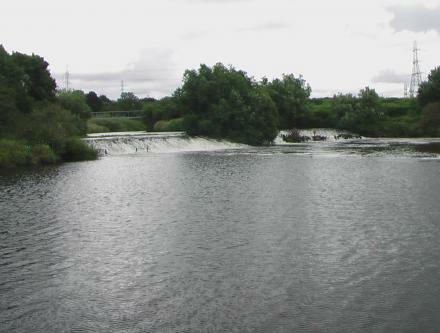 The nearest place in the direction of Walton Junction is Irlam Wharf; 2½ furlongs away. The nearest place in the direction of Pomona Dock No 4 is Irlam Viaduct; ¾ furlongs away. Manchester, M44 5 — 1607 yards to the southwest. 557 Liverpool Road Irlam, Manchester, M44 6ZT — 1021 yards to the west. Manchester — 285 yards to the southeast. 621-623 Liverpool Road, Irlam, Manchester, M44 5BE — 1132 yards to the west. Soul All Dayer In Aid Of The Rainbow Trust. Manchester — 1426 yards to the west. Manchester, M41 6ND — 1556 yards to the northeast. Irlam, Manchester, M44 6ZJ — 912 yards to the west. Carrington Business Park, Carrington, M31 4DD — 1264 yards to the southeast. Brinell Drive, Northbank Industrial Park, Irlam, M44 5BL — 1474 yards to the southwest. Unit 4 weir mill, stockport United Kingdom, SK3 0AG — 1566 yards to the west. Manchester — 1295 yards to the southeast. Liverpool Road, Irlam, M44 6BR — 902 yards to the northwest. compton close, Flixton, M41 6WG — 1178 yards to the northeast. Liverpool Road, Manchester, M44 — 1112 yards to the northwest. Manchester, M31 — 1301 yards to the southeast. Manchester — 1306 yards to the northeast. Irlam — 548 yards to the southwest. Irlam Wharf Road, Manchester, M44 5PN — 505 yards to the southwest. Wigan — 1567 yards to the north. Unit 3, 641 - 651 Liverpool Road, Irlam, M44 5XD — 1439 yards to the west. 312 Liverpool Road, Manchester, M44 5UG — 1019 yards to the northwest. Manchester — 1404 yards to the west. Carrington Business Park, Manchester — 1250 yards to the southeast. Liverpool rd, Manchester, M445AZ — 1160 yards to the west. Manchester — 1045 yards to the west. Prince's Park, Irlam, M44 6BR — 729 yards to the northwest. Wythenshawe Park Wythenshawe Road, Manchester, M22 0AB — 1239 yards to the northeast. Manchester — 1253 yards to the northeast. 113 Irlam Road, Manchester, M41 6 — 1626 yards to the northeast. 857 yards to the south.